Views from all directions are beautiful. The building is warm and welcoming, with comfort a priority. Double patio doors, reached by short, level access from the parking area, open into a large living room with high, vaulted beamed ceiling . There is ample, comfortable seating, including three settees and an electric riser/recliner chair, fitted shelves incorporating a large TV /DVD player, and a stereo music centre with CD player. The floor is oak, with plenty of space around the furniture for easy wheelchair manoeuvrability. Wi-Fi internet access is also available in this area, together with a comprehensive selection of DVDs, books, puzzles, local information brochures, etc. Between the main living room and kitchen is a dining area with pine dining table which will accommodate six - eight people. Living accommodation is all on the ground floor, although there is an extra room if required on the large galleried, carpeted mezzanine floor (carpeted stairs leading from living area). This area may be used as either a playroom for children, extra seating, or an additional bedroom (this room offers either one or two single beds, with space for a cot, as required). The dining area leads to a modern, well-equipped kitchen, including hobs, oven, microwave, fridge/freezer, dishwasher, and washing machine. The kitchen is well equipped with a wide range of cooking utensils, crockery, cutlery etc., together with items such as coffee makers, blender and food processor. French windows lead onto decked terrace and lawn, overlooking the garden and field, backed by woodland. The twin master bedroom has an ensuite bathroom, with widened doorways both from the corridor into the bedroom and from the bedroom into the bathroom. This bathroom has been built in the style of a "wet room" with shower, washbasin and toilet, designed with wheelchair users in mind. Rails have been fitted, and a good quality shower chair is available, adjustable to be used in conjunction with the lavatory or as a commode, and a "perching stool" is also available. This bedroom has one fully adjustable, electric, profiling remote-contolled Volker bed with pressure mattress and retractable sides as required. together with a standard divan bed, which may be fitted with either optional cot sides or grab handles. Although the Volker beds have the versatility of hospital beds, they are of an attactive design, with wooden frames, and are equally comfortable for our disabled and able-bodied visitors. They feature adjustable platform height, making them extremely convenient for carers (see video clip on the "Disabled Facilities" tab), adjustable head and foot raise, or full platform tilt. This room contains a remote-controlled television/DVD player, fitted double wardrobe, bedside cabinet and dressing table. French windows lead onto the terrace and garden, with views across the field to the woodland beyond. 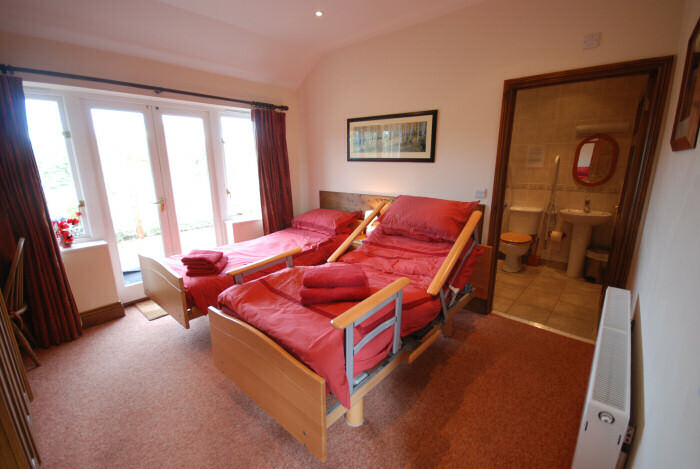 The second double bedroom has twin divan beds, with the option to attach either cot sides or grab handles if required. These beds may be used as two singles, or joined to form one super kingsize (6 foot wide) bed. One bed is also electric and profiling, and may be fitted with hospital sides if these are needed. There is a remote-controlled TV/DVD player, fitted double wardrobe, bedside cabinet and dressing table. Full-length French windows lead onto the terrace and garden, with views across the garden and field to the woodland. The third bedroom contains one fully adjustable, profiling, electric Volker bed, as in the master bedroom, with optional retractable cot sides as required, and pressure relieving mattress, remote controlled TV/DVD player, fitted wardrobe, bedside cabinet and has views onto gardens at the rear of the property. The second shared bathroom is also in the style of a "wet room", with shower, bath, washbasin and toilet. The bath has been designed to allow hoist access if required. There is also a fold-down shower table over the bath for those needing to be showered lying down, wheelchair-height shaving mirror and bathroom scales. The building is warm, welcoming and centrally heated throughout. A container-planted decked area with picnic tables and seating runs for the entire length of the property and gives access to the garden, which contains a good sized and attractive built-in brick barbecue. Padded garden loungers are available. There is parking for 2-3 cars. All bedding and towels, tea-towels etc. are provided, together with a welcome pack of food items, including the freshest free-range eggs from our own hens, home-made bread and a bottle of "Red Barn" locally produced dry white wine. Essentials such as toilet paper, kitchen paper, tea, coffee, sugar, milk, cheese, butter, orange juice, washing powder, dishwasher tablets, washing-up liquid, etc. are also provided. 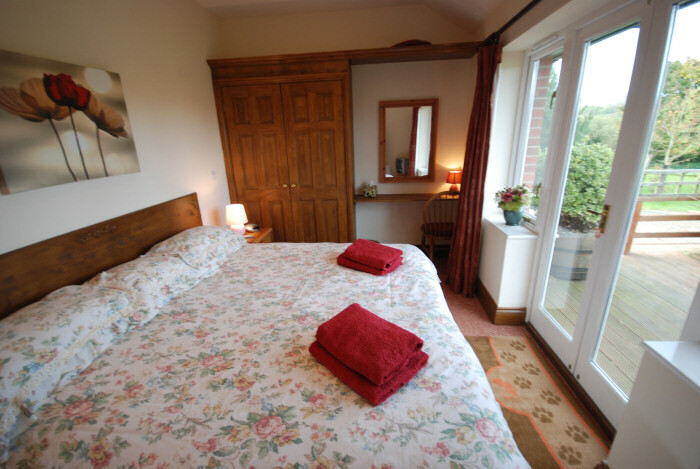 The building is very adaptable to the needs of individual guests, and the style of bedding and layout of bedrooms can be altered to cater for our visitors' requirements. Cots, highchair, stairgates and baby monitor are available if required, along with children's bedding, Duplo bricks, dolls house, soft toys, outside games, etc. 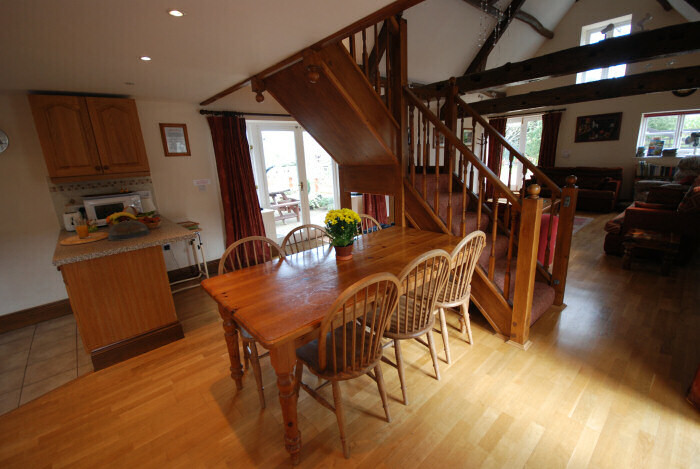 The garden area is securely fenced, with immediate access to footpaths through the countryside, and delightful walks. We have a thriving community of red squirrels which can be viewed at close quarters or photographed by wildlife enthusiasts, and we have had barn owls nesting in the grounds for the last few years. Guests have a clear view of their nest box, and have been delighted to see the owls flying around as they sit outside on a summer evening. Hot tub hire is available on request, which has proved very popular - the tub being set up just outside the patio doors for easy access. A wildflower meadow is planned for 2013, which will incorporate a wheelchair-accessible pathway through the meadow down to the red squirrel feeding stations. 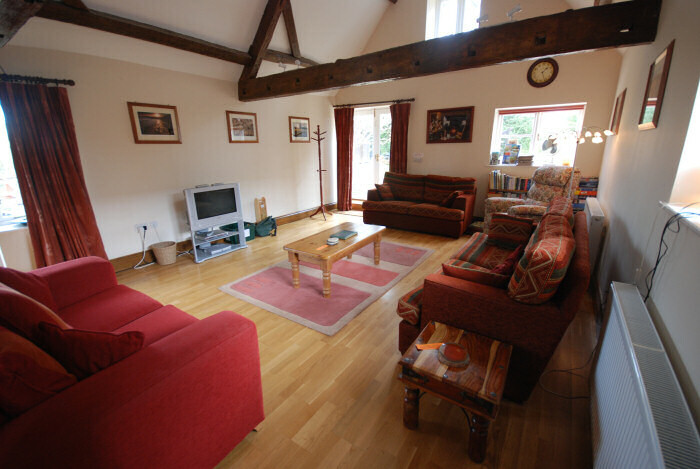 Prices per week are displayed on the tarriff tab (Please note that these prices are for the accommodation, which comfortably sleeps seven, not per person). We do get heavily booked in the summer period, so please book early to avoid disappointment. A non-returnable deposit of �200 is required at the time of booking, with the balance invoiced six weeks before holiday dates. A �100 security bond against breakages is also requested with the final invoice, but this is returnable at the end of the holiday. As cancellation within six weeks of travel cannot be refunded, we strongly recommend that visitors take out appropriate holiday insurance.